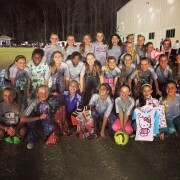 Norfolk Public School recently featured Pajama Jams and its founder, Erika Tucker, on NPS Now. For the second year, Pajama Jams partnered with NPS, and provided new pajamas to students of three Norfolk elementary schools regardless of their needs. Look for Erika and Pajama Jams here. Read all about it! Click here. 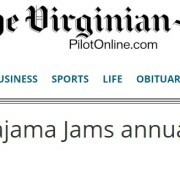 http://pajamajams.org/wp-content/uploads/2015/11/Beach-Briefs.jpg 327 964 pajamajams http://pajamajams.org/wp-content/uploads/2018/11/PajamaJamsLogowithWeb-10year-4-1.jpg pajamajams2015-11-13 16:03:242016-05-20 23:18:48In the News: featured in the Virginian Pilot's "Beach Briefs"
Did you see us on The Hampton Roads Show? If you missed us, click to view the segment! http://pajamajams.org/wp-content/uploads/2015/11/HamptonRoadsShow2.jpg 330 518 pajamajams http://pajamajams.org/wp-content/uploads/2018/11/PajamaJamsLogowithWeb-10year-4-1.jpg pajamajams2015-11-12 23:55:162015-11-13 00:01:51Did you see us on The Hampton Roads Show? Tune into WAVY TV’s The Hampton Roads Show on November 11th at 9:00am! 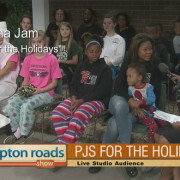 Pajama Jams’ Erika Tucker will be interviewed to kick off our 4th annual PJs for the Holidays Program.